Cosmic rays visualised over Nanuq. Every second, each square centimeter of us and our Earth is hit by about 10,000 cosmic rays, charged subatomic particles coming from outer space and that can reach very high energies. Their flow is particularly intense in the Arctic (and Antarctica), as they are attracted by the high magnetic field at the Earth’s Poles. Discovered in 1912 by Austrian physicist Victor Hess (1936 Nobel Prize for Physics), more than 100 years later cosmic rays are still a new frontier in physics. High energy cosmic rays interacting with our atmosphere have travelled in the cosmos for hundreds, thousands or even millions of years. Their energy is so high that it cannot be generated by supernovae, pulsars or even black holes. Where do they come from? Their origin is not yet understood. Cosmic rays are not just a puzzling scientific mystery to solve for physicists and astrophysicists. Recent studies suggest that cosmic rays may influence cloud cover either through the formation of new aerosols (tiny particles suspended in the air that can grow to form seeds for cloud droplets) or by directly affecting clouds themselves. The Earth’s global cloud cover has a crucial impact on climate and understanding how this works in detail is necessary to develop an effective mathematical model able to explain the past and predict the future evolution of the earth’s climate. The cosmic ray detector is finally assembled and our dear and dynamic team left the workshop. Here is the Extreme Energy Event video resuming the event. Thank you all for participating !! Built by school students from Switzerland, Italy, Iceland and Norway at CERN, PolarQuEEEst is a special detector to catch cosmic rays coming from the distant regions of our universe. 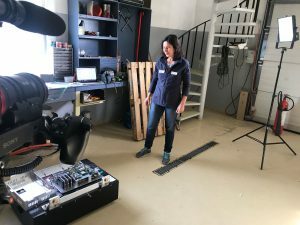 Three of these special “telescopes” will be built to measure the cosmic ray flux at different latitudes, with one of them on board Nanuq and the two others installed in the schools of the students from Italy and Norway who will build them. The project is part of the Extreme Energy Events – Science Inside Schools (EEE) project coordinated by the Museo storico della Fisica e Centro Studi e Ricerche Enrico Fermi (Centro Fermi), an Italian research institute with its headquarters in the historic building of the old Institute of Physics in via Panisperna in Rome, where Enrico Fermi made his famous studies on the importance of slowing down the neutrons to produce induced radioactivity. The EEE project combines an experiment on cosmic rays studies with an intense program of scientific culture dissemination with the direct participation of students from Italian high schools (more than 100 institutes presently involved). A network of 50 more sophisticated “telescopes” for cosmic rays is installed in Italy, all put in coincidence using GPS, with the goal to detect cosmic muons produced by primary cosmic rays of the highest energy. In its mission, the PolarQuEEEst detectors joined the present network allowing the study of cosmic rays at latitudes till now not well covered. CERN, INFN Bologna and INFN Bari collaborated on this project. 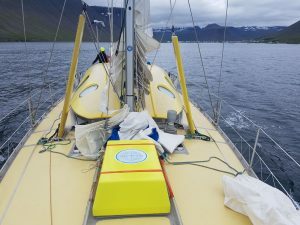 The Polarquest2018 mission started on the 22nd of July 2018 from Isafjordur (Iceland) and ended on the 4th of September in Tromsø (Norway), after sailing for about 3500 NM. The POLA-01 cosmic ray detector, on board Nanuq, took data almost continuously, integrating at the end about 861 hours of data with a global efficiency of about 91%, with small breaks due to various reasons (main power down, difficult weather conditions, detector reset, etc.). POLA-02 and POLA-03 were functioning during the whole period, with essentially 100% efficiency. In total, more than 110000000 tracks per detector were collected. 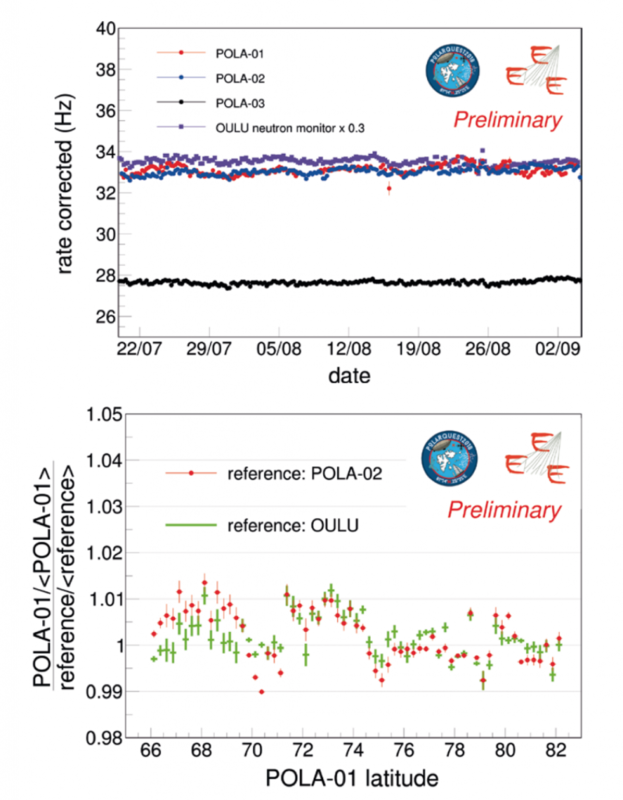 Data from POLA-02 and POLA-03 could be verified and analyzed online by the students in Nesodden and Bra. This was not possible with POLA-01 because an Internet connection was not available onboard. Instead, all data was regularly reconstructed and stored on Nanuq, checked by the scientist on board, and a small set of trending information was sent daily using a satellite phone to allow a more precise verification by the experts. All the data is presently stored at INFN-CNAF computer centre and is available also for all students in the standard EEE data repository, via web access. Overall, the PolarquEEEst experiment successfully collected data on cosmic rays between 66° and 82° N latitudes, a region with, up to now, very few measurements. 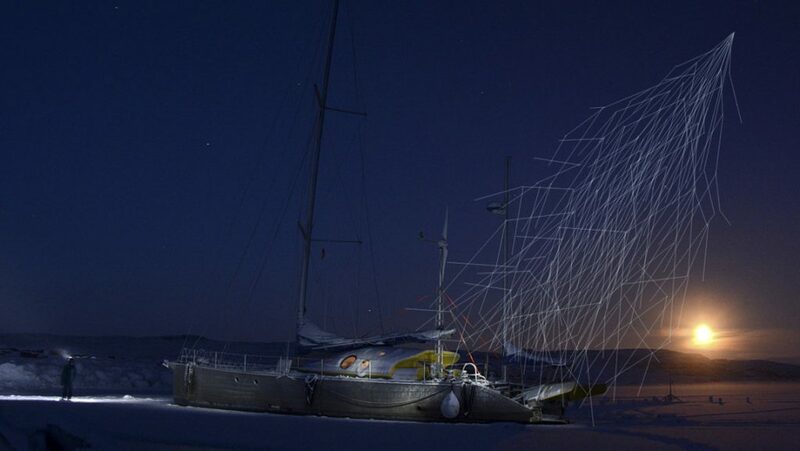 The detector performed excellently, despite the tight constraints imposed by its integration inside a sailing-boat. The choice of involving high school students in this experience received great enthusiasm and interest and proved, once more, the success of the idea to combine a physics experiment with a science dissemination program, as done for the first time by the EEE project of Centro Fermi. Read the report from Polarquest scientists on the success of the mission here. PolarQuEEEst detector (yellow box) on board Nanuq. Top: the preliminary rate of the three POLA detectors as a function of time, compared with the neutron cosmic ray data from the OULU experiment in Finland. Bottom: the preliminary double ratio POLA-01/ over reference/ versus latitudes with POLA-02 and OULU as references.